As the name of this site suggests, Divi4u is a site dedicated to the Divi WordPress theme by Elegant Themes, and it is for you to fully enjoy this theme. 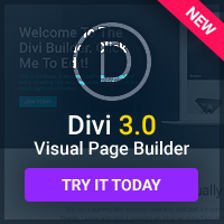 But this is not just a blog about this theme, here you will find much more as this site includes some useful tools and resources to get the most from Divi. I know that one of the things that WordPress users really appreciate is to be able to see real examples of websites which are using the themes they are interested in. Whether you are considering to buy a particular theme for a new site or whether you already downloaded that theme, I´m sure you would like to see what others did with it. Sometimes you can get very inspiring ideas that you won´t get from the theme demo site. And don´t get me wrong, I´m talking here about ideas, not about just copying what others already made. So when I thought about launching this new site about the Divi WordPress theme, I was positive about the Examples of sites using Divi page being the first tool to be included. This site also includes a tool that many of you may find interesting for a quick check: The Divi Theme Detector. If you guess that a site you like uses the Divi WordPress theme, just enter its address and hit the button to check it out. This tool will analyze it for you and will show some details such as the theme version or if a child theme is being used. In case the site does not use Divi, it will tell you the name of the theme used. It only works for WordPress sites, so if WordPress is not detected on that site the tool will tell you so. 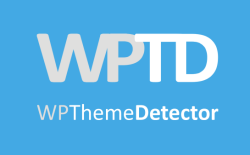 If you´re not just checking if a site uses Divi and would like to get more information about any WordPress site, such as plugins being used, detailed information about the themes and providers and much more, then you should use WPThemeDetector instead. I always recommend using a child theme. If you are not familiar with the reasons behind it let me just tell you that, if you do not use a child theme, all the modifications you made to customize your WordPress theme will be lost as soon as you update the theme to a new version. I will soon publish a post explaining child themes in more detail, but if you don´t want to wait until then, you can read my Child Theme Tutorial Series at the WPTD Blog, or this post by Nick Roach published on the Elegant Themes Blog. 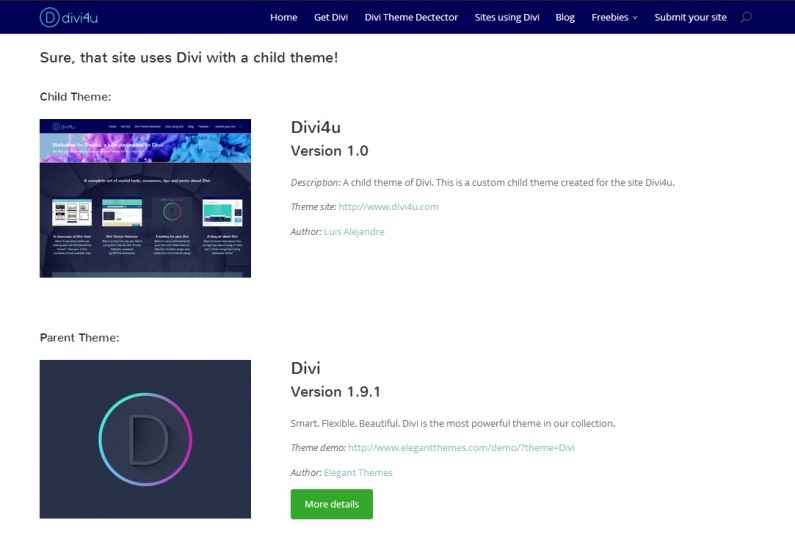 Since I planned to offer in this site some freebies to make things even easier when working with Divi, I thought that it could be a good idea to develop a free plugin specifically intended for helping you create a child theme of your Divi WordPress theme. It grabs the information about you and your site so you don´t have to type it (but of course you can change it before creating the child theme). It creates a stylesheet that is ready for tweaking Divi with section titles taken from the parent theme, so you can have everything under control and won´t get lost in the CSS ‘jungle’. It creates a basic functions.php file for you. It allows you to customize the credits or copyright line of your footer, showing your dates always automatically updated thanks to an included function. It uploads a default screenshot for your child theme. It allows you to change that screenshot at any moment, directly from your WordPress admin area. With this plugin you won´t need to use ftp to create your child theme. I hope you all enjoy it. And of course, this site also includes a blog all about Divi. In fact you are reading the very first post of this blog, but there will be many more of them. Future post will be of different kinds: news about this great theme, tricks, tips and tutorials, news about this site such as the release of new features when we upgrade our tools and resources, or the release of new freebies, just to name a few of the different topics to be expected here. And of course, any suggestion will be welcome. So, if you are interested in the Divi WordPress theme, make sure you subscribe to our blog to get our exciting news!